Tomatillos are fun to grow in the garden, and there are tons of yummy uses for them in the kitchen. If you’re new to growing this cool vegetable in your garden, it can be tricky to know when and how to harvest tomatillos. 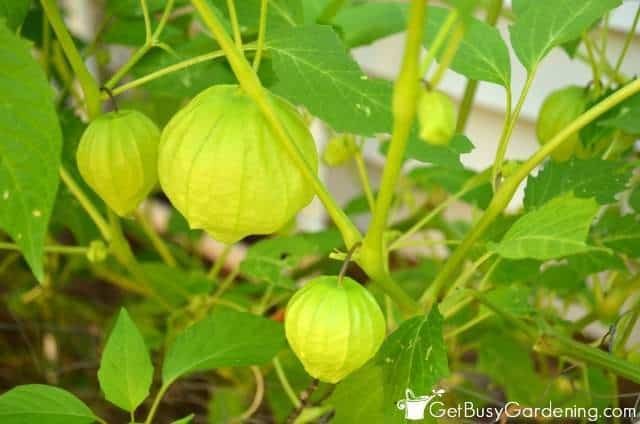 Tomatillos start out as cute lanterns or balloons, and sometimes these little lanterns will grow huge long before the tomatillo inside is ready to harvest. You might think the tomatillos look like they’re ready to be harvested, but one quick squeeze and you’ll discover that the lanterns are empty. Don’t worry, soon it will be obvious when your tomatillos are ready to be harvested. There are a few ways to tell that it’s time to harvest tomatillos. One way to tell that tomatillos are ready to harvest is that the the outer husk (the cute lantern) splits open, and it looks like the tomatillo is busting out. The husk may turn brown and papery once it splits open, or it might stay soft and green. Either way, a tomatillo is ready to harvest once the husk splits open. Another way to tell that it’s time to harvest tomatillos is when the husk turns brown and papery, but it doesn’t split open. Once the husk turns brown and papery, the tomatillo is ready to harvest even if the husk hasn’t split open. Once you determine that a tomatillo is ready to harvest, it’s best to cut it off the plant rather than pulling it off. But many times ripe tomatillos will come off the vine easily with a gentle twist. 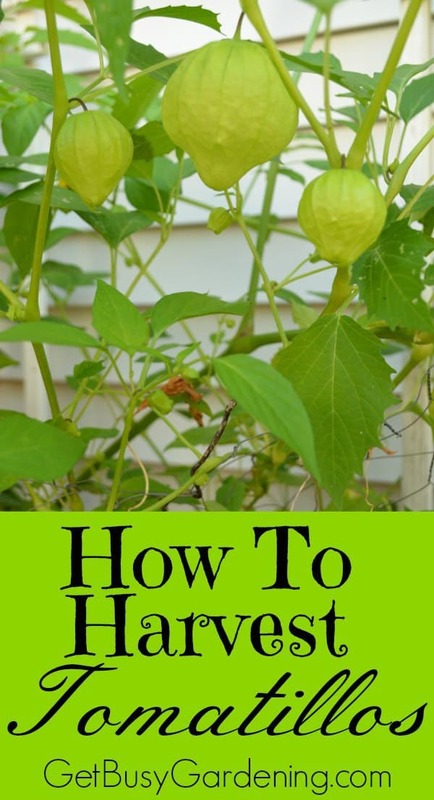 Just don’t tug or force the ripe tomatillo off the plant or you could damage the stem. Tomatillos can also be harvested when they’re small, before the husk turns brown or splits open. So, if a hard freeze is coming, you can harvest all the tomatillos that are left on the plant, and still use the small ones for your recipes. 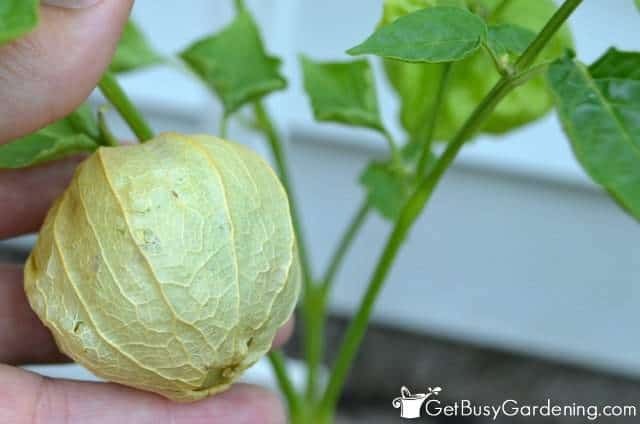 Once the plant starts to get heavy with tomatillos, you will need to stake tomatillo plants in order to keep the stems from collapsing to the ground – just like you stake tomato plants. Tomatillos take a long time to produce fruit, 70-100 days. But they are pretty cold hardy and can withstand the first few light frosts in the fall. 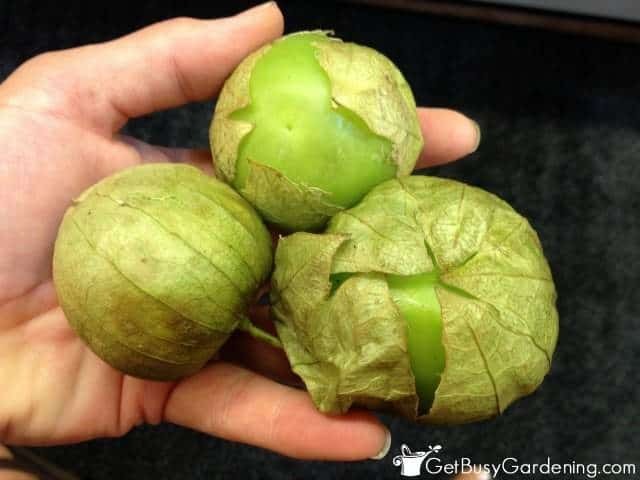 If you’re interested in growing tomatillos in your garden, here are some great quality seeds you can buy to get started… green tomatillo seeds and purple tomatillo seeds. Do you have any tips for how to harvest tomatillos? Please share them in the comments section below. I grew tomatillos a couple of years ago and they did great. My neighbor is much better with them than I. He also makes a great tomatillo salsa that is fantastic with a whole wheat cracker. Yum, I love tomatillo salsa!! This is my first year growing tomatillas. I bought a plant from a store. I planted only that one plant. My plant probably has 200 tomatillas on the plant. Had no idea it would yield that many. If they all do not ripen before our first frost can I bring them inside to ripen? How fun!! They are prolific plants, aren’t they? Love it! You can actually use tomatillos when they’re small too, just like you would use them when they’re ripe. They’re sweeter when they are ripe. I always harvest everything that’s on the plant before frost, and then I use them to make sauces and salsas. I freeze the sauces and either can the salsa, or eat it. 🙂 Yum! Great information on when to harvest the tomatillos. I’ve always been uncertain as to whether to wait for the lantern to turn brown before harvesting. But I live in Washington State and the lanterns never seem to turn brown. We harvest anyway and cook them like you would fried green tomatoes. Yummy! I’m going to try freezing some of them this year. Thanks for the info. You’re welcome! Yep, we harvest them young too, they good to eat even when they’re small. Enjoy! My first year growing these little beauties! I need to add more support as The plants are prolofic producers and they are weighing down the branches. Wondering how long they will keep in my pantry before I have to start ptocessing them? Do they ripen like a tomato in the dark? Do they stay green? Need some recipes now to make some salsa and whatever else they are good for? Yes, they will need support for sure! I use wire tomato cages to support my tomatillo plants, they work great! Tomatillos will stay green, and won’t ripen like tomatoes. You can eat a tomatillo at any size, so in the fall I just harvest everything that’s left on the plant and use it in recipes like salsa and sauces. 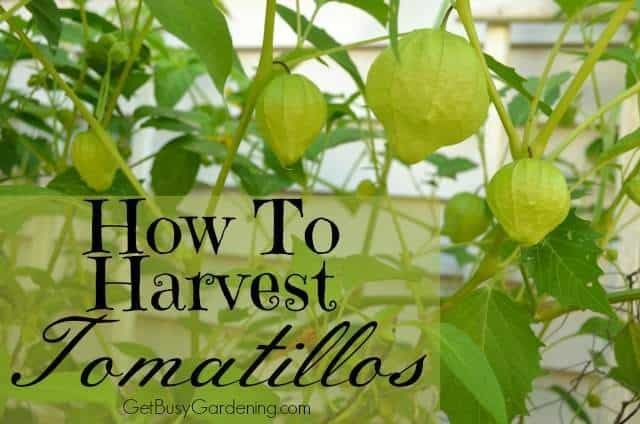 I have never grown tomatillos before but this is handy information to have. Thanks for sharing your tips! They’ve only grown to approximately 1.5 to 2 feet tall. I am also growing 2 different varieties in just 5 gallon Root Pouches, and the ones in the bags have so far grown to almost SIX feet tall!!!! AND they’re LOADED with fruit that are just about ripe!!! They are amazingly beautiful plants! We have never eaten Tomatillos before… But I think that even if we don’t like them… I’m going to grow them, JUST for their beauty and the fact that they are major pollinator magnets… And SELL the fruit! Lol??? Haha, awesome idea! I think you’re gonna love them though. They’re excellent for salsa and other sauces you can make for Mexican dishes, there are tons options for using tomatillos in cooking! Thank you for the tips on harvesting Tomatillos! Are tomatillos good to eat when the fruit turns yellow. They seem firm and the shell is brown. Friends told me they are tomatillos, which I have never tasted before, although I have seen them in markets. the fruit, ripe or not, may be picked and used preceding a freeze. That should save a lot of tomatillos because there must be at least 80 or 90 on each of my two plants. I plan to share a lot of them with neighbors. Awesome! What a surprise for sure, LOL! They are very prolific plants. I’ve been trying to grow tomatillos for a couple of years, but this is the first time I’ve actually succeeded. I have three large plants now, two in the ground in cages, and one in a container. All the plants are full of fruit, but none of them have grown large enough yet to fill the lanterns. I’m not sure what I’ll do with them yet, but they will probably get used in tomato dishes, salsa, stir-fries, curries etc. Yes, there are tons of great recipes that you can use tomatillos in, yum!! So happy for you that you finally have had success growing them this year! Great job. I’m originally from Boston, moved to Chicago and then I heard of Salsa Verde. I don’t eat hot spicy food. But I’m a hotel Controller who works with many Hispanics. You should see their eyes light up when they see me coming in with bags full of Seranno peppers, jalapeno’s, Tomatillos, Sport peppers, cucumbers, Cherakee Purple Heirloom tomatoes, Zuchinnis. This year they also get Carolina Reapers! They all live in apartments and don’t have gardens, so, I like to garden, they like fresh! Fantastic, sounds like a win-win situation to me. 🙂 P.S. Tomatillos aren’t spicy at all, they’re very mild like a tomato. But maybe you were talking about the peppers being spicy. They are sweeter and smoother, without the tart, edge if you wait until they turn yellow. I LOVE tomatillo salsa, made with jalapenos and onions, equal amounts of all three, broiled until just charred, cooled and ground up in the blender. The best!! Interesting, I’ve never had any of my tomatillos turn yellow before, even after they stay on the plant longer than I would normally harvest them. Thanks for adding your tip! Thank you for the information. I actually grew tomatillos by slicing and planting the slices in soil. I have an amazing plant. It is producing like crazy. Now I know when to harvest. Thank you. Thanks for info! So, you say you pick ALL the remaining tomatillos when frost threatens? That’s including those that are only half the full size in the pod, say down to the size of large olives? I keep reading that the very small undeveloped ones are toxic, poisonous, etc. I have a lot of them ready to pick, but also a pile of those quite underdeveloped ones that I’d like to use if safe. We don’t have a long growing season here in Michigan’s Upper Peninsula. If the weather holds, it will frost Friday night (9/27) and that’s a fairly late frost for us! Tomatillos are in the nightshade family, along with eggplants, potatoes, peppers and tomatoes, all of which contain the toxin you’ve heard about. The leaves and stems of the plant have a much higher concentration of the toxin than the fruit, which is why these vegetables are edible (but no other part of the plant is). I’ve also heard that wild tomatillos may have a higher level of the toxin than cultivated varieties, so it might be wise to do more research about those before eating them. I’ve never heard of small, undeveloped tomatillos being more poisonous than mature ones, so I can’t speak to that. However, if you have an allergy to the nightshade family, then you will likely have a problem with eating tomatillos. I will say that I harvest immature tomatillos every fall before frost, and have eaten them many times myself without any issues. I don’t pick them as small as the size of an almond. I only harvest the ones that are about 1/2 the mature size or larger.